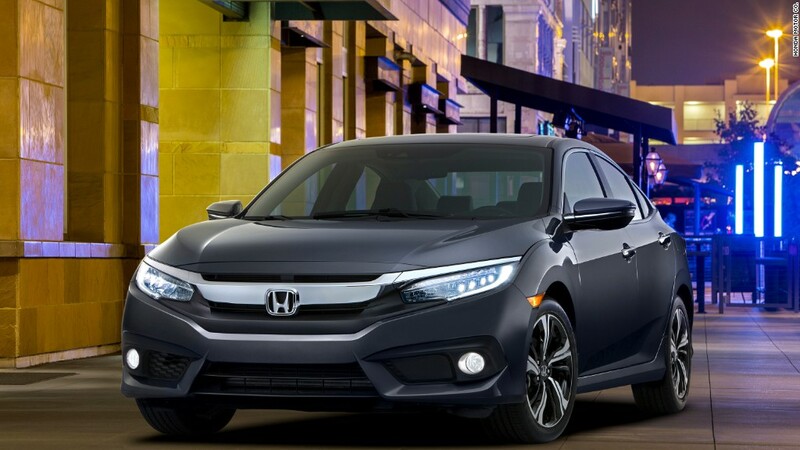 Honda describes its new Civic as its most ambitious remake of the compact car ever. It's clearly the most important. Honda (HMC) unveiled the production version of the 2016 Civic late Wednesday and it will arrive in showrooms soon. The former top seller has fallen on hard times in recent years. Sales of the Civic are down 4% this year, while sales improved for rivals such as the Toyota (TM) Corolla and Hyundai Elantra, as well as the compact car segment overall. The Civic even suffered in comparison to other Honda models: The Honda CR-V crossover outsold the Civic for the first time in 2014 and continues to outsell it this year. The new Civic looks nothing like the most recent economy versions. Besides its sportier look, Honda promises better performance, making it the first Honda model to offer its new VTEC turbo engine. It also has a longer wheelbase and longer hood, as well as 20-inch wheels, lower air intakes and new LED headlights. Honda also added technology to make it easier to use both iPhones and Android smartphones while driving the cars, allowing easier voice commands for the phone through the car's built-in display. The Civic's 2012 redesign was a major embarrassment for Honda, as critics complained about the cheapness of the interior and the poor quality of the ride. Consumer Reports rated the 2012 model too poor to earn the magazine's recommendation, a first for the model. While Honda quickly fixed many of the problems for the 2013 model, it's had trouble winning back buyers. "The Civic established Honda as a viable Japanese automaker in the U.S., but recent versions haven't lived up to its iconic status," said Karl Brauer, senior analyst with Kelley Blue Book, in the spring when Honda gave a peak at this redesign at the New York auto show. "The 2016 Civic should correct that trajectory." Honda is looking for a bounce back year after it was dogged by safety questions related to the exploding Takata airbags. The airbag fiasco affected 10 automakers, but most of the recalled cars were made by Honda. Other problems for Honda include a $70 million fine from U.S. safety regulators for failure to properly report accident data involving its cars, and the resignation of Honda's CEO. Correction: An earlier version of this article incorrectly reported the basis for the $70 million fine.